Here at the Crozet Islands in the Southern Indian Ocean, at 41 deg S, we’re well north of what is considered ‘inhabitable’ territory in the Pacific Ocean. However, in comparison this far-flung corner of France, midway between Africa and West Australia, Madagascar and Antarctica, where the waters are cooler and the air is moister, the tree-line is below sea-level. The Crozet and Kerguelen Islands groups were among the last major land-masses discovered. They were found in the 18th Century (1772), by Marion du Fresne who met his waterloo in New Zealand. He, like other explorers of the period went in search of the great southern continent. Having first found Marion Island (to South Africa) he named this island group after his Second in Command, Crozet, and claimed them for France. Kerguelen Island, 1400 km to our south east is a huge landmass (6,675 km2), but due to the cold conditions and low sunshine hours, like Crozet, it supports only ground-level, tussocky vegetation. Crozet has a very limited set of native plant species, with around 20 native vascular plants, although I’m reliably informed that there are around 60 introduced species, mainly around the scientific base. Probably the most famous of the native species is the Kerguelen Cabbage Pringlea antiscorbutica, family Brassicaceae, endemic to sub-Antarctic Indian Ocean Islands, including Kerguelen, Crozet (France), Prince Edward & Marion Islands (South Africa) and the Heard & Macdonald Islands (Australia). Named for the president of the Royal Society (Pringle) by James Anderson, the surgeon on Captain Cooks’ vessel, this was reputedly eaten by sailors, to stave off scurvy (La scorbute in French). Its’ tough, slightly hairy looking leaves are not very appealing looking (in a culinary sense, I mean), but I suppose desperate times called for desperate measures. Now a fully protected plant, we have not been driven to supplementing the excellent rations here with it. In sheltered areas it grows larger, with a tall stalk. 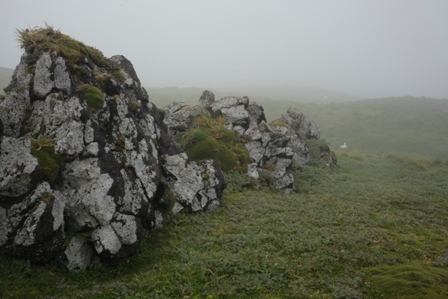 At Kerguelen Island, its habitat has been decimated by rabbits and other rodents, and its restricted to fenced reserves on the mainland or to the smaller islands of the group. Its reputed to be larger and have a more expansive growth form at Kerguelen than at Crozet, and further research is needed to assess inter-site differences for the species. Kerguelen cabbage Pringlea antiscorbutica grows amongst Acaena magellanica and Blechnum penna-marina at Possession Islands northern tip, at Pointe Basse. Photo: Susan Waugh, Courtesy of Susan Waugh. 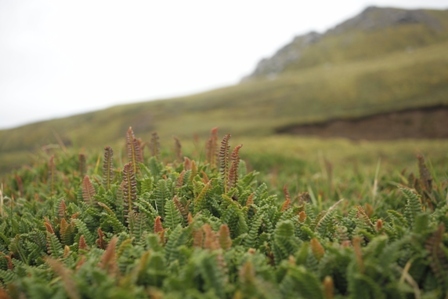 A familiar friend to most outdoorsy kiwis is Acaena magellanica. Here it forms whole fields, and along with a small, tough fern, Blechnum penna-marina (another species shared with New Zealand, but restricted to Sub-Antarctic sites in the Indian Ocean), forms dense swards on the low-lying parts of the islands. 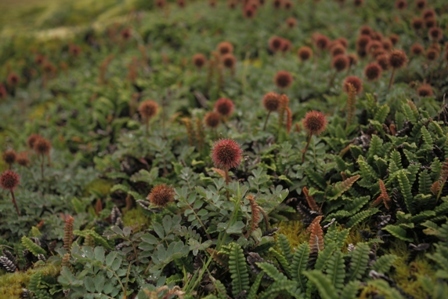 Acaena magellanica growing in a dense sward at Pointe Basse, Possession Island. Photo: Susan Waugh, Courtesy of Susan Waugh. Around the area where my work has been centred in the north of Possession Island, at Pointe Basse, a major albatross nesting area, these two plants dominate the less boggy areas. I’m not used to seeing whole hectares of the Acaena at one time, but they seem bigger and more luxuriant than the ones I’ve encountered in New Zealand. Many happy hours are spent picking its extra-long ‘Crozet special’ spines out of socks and gloves at the end of the day. Fern Blechnum penna-marina forming mats with moss. Photo: Susan Waugh, Courtesy of Susan Waugh. Along the coastal margins, there is Leptinella plumosa, a delicate green-grey coloured, flat growing daisy, which is very pretty, and also seems quite hardy. 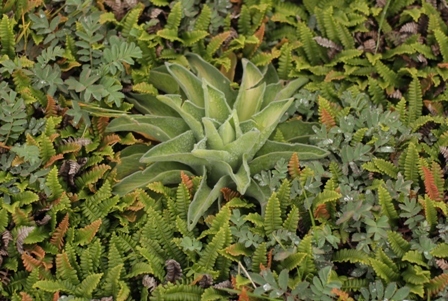 It grows close to the ground with tiny leaves in wind-swept areas but with a larger, more feather-like leaf form in more sheltered environments. It is quite restricted in its range, and is really only found on the dryer cliff-tops to the west of Pointe Basse, although it may be widespread elsewhere around the island. All the plants in this area receive a liberal dosing of salt spray almost daily, and can live in very damp and low light conditions. Azorella selago and Leptinella plumosa. Photo: Susan Waugh, Courtesy of Susan Waugh. A favourite among the French scientists is the mat-forming Azorella selago (Family Apiaceae), which grows in dense mats. They have named various feature of the island after this plant, including an accommodation block at the research base, and it has featured in a recent series of postage stamps. It has delicate yellow flowers, and the mats can be several hundred metres in extent. To protect this, and the moss beds, we bird researchers wear snow-shoes to traverse the terrain, and we avoid walking across the mat plants where-ever possible. Volcanic rock forms and misty weather at Pointe Basse. Photo: Susan Waugh, Courtesy of Susan Waugh. Moss mats and stream near Pointe Basse. Photo: Susan Waugh, Courtesy of Susan Waugh. The remaining common vascular plant is the grass Poa cookii which seems to keep the steeper hillsides together, growing together with the Acaena. This grows in abundance on steeper parts of the terrain, and seems to favour areas with high nutrient inputs, such as around albatross nests, or where giant petrel colonies are established. 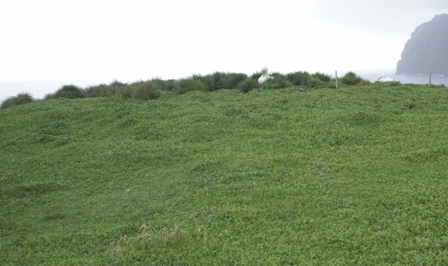 Poa cookii surrounding an albatross nest in a field dominated by Acaena magellanica. Photo: Susan Waugh, Courtesy of Susan Waugh. Finally, there remains to describe the vast, creeping, spongy carpets of moss. I’m sure there is a life-times work for bryologists here at the Crozet Islands. At this rather windy, rainy, and foggy northern end of the island, moss is truly the dominant life-form. This gives the landscape a very special appeal. 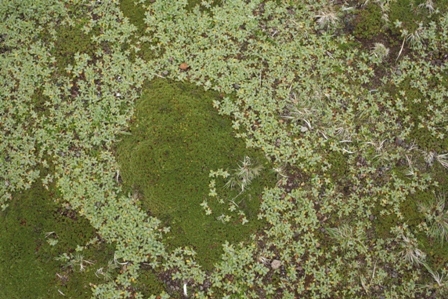 In places, the moss forms up into dense blankets, and ridges appear, rather like the folds in a Shar-pei puppy’s skin. It is rather better to look at than to walk across! 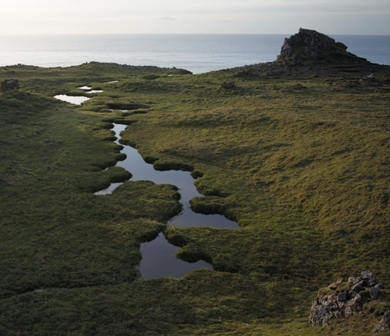 In other places, the water percolating through the peaty soils seems to interact with the moss to create convoluted creeks and trickling waterways. 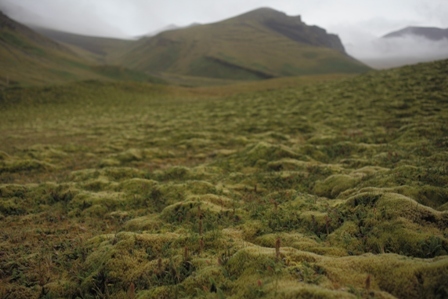 Moss forming ridges across a low hill at Pointe Basse. Photo: Susan Waugh, Courtesy of Susan Waugh. While restricted in diversity, the delicacy and intricate interactions going on between the plants of the Crozet Islands and other species make this a very appealing environment for research. The staff of the Nature Reserve of the Terres Australes et Antarctiques Françaises and Institut polaire francais Paul Emile Victor (IPEV), work closely with the researchers and logistics teams to minimise the impact of human activity on the flora and fauna of the islands, and keep them in their pristine state. Here at our field cabin, it’s difficult to imagine how we could further reduce our environmental footprint.